Lyndhurst is fortunate to retain the furnishings of the three families who occupied the estate over the past 175 years. The three suites of parlor furniture at Lyndhurst were installed in 1838-42, 1865 and 1882 and were created during a century in which the United States struggled to establish its national identity. The date of each suite correlates approximately to the three main economic events of the 19th century—the opening of the Erie Canal in 1825 that set New York City as the country’s financial capital, the end of the Civil War in 1865 that sealed the industrial dominance of the North, and the end of Reconstruction in 1877 that started the Gilded Age. The evolution of these three parlor suites reflects not only the progression of American identity during this period but also the development of attitudes towards the built environment and material culture that we still hold today. The earliest parlor, the extensive suite of parlor furniture by Alexander Jackson Davis designed in 1838-42 remains in situ in Lyndhurst mansion. The second and third parlor suites have been recreated in Lyndhurst’s Carriage House Exhibition Gallery. The second parlor suite, in the French taste, was installed circa 1865 for dry goods merchant and railroad inventor George Merritt and features a monumental sculpture by Giovanni Benzoni that Merritt originally saw at the Crystal Palace exhibition. Benzoni was a follower of Canova and fixture of the Grand Tour. He is best known for his sculpture The Veiled Rebecca in Hyderabad, India. The third parlor suite, installed in 1882 in a decorative scheme by the Herter Brothers for railroad baron Jay Gould features a 10 piece Herter Brothers parlor suite circa 1870 with the additions of rare Orientalist style pieces by Christian Herter, transom windows attributed to John LaFarge and a monumental landscape by Gustave Courbet. The exhibition can be viewed at the conclusion of regularly scheduled tours of Lyndhurst, available on line at www.lyndhurst.org or in person at the Carriage House Visitors’ Center, open Friday, Saturday and Sunday from 10:00 am to 4:00 pm. The opening reception for the exhibition will be Thursday, June 20th from 6:30 to 8:00 pm and the exhibition will remain open throughout 2013. 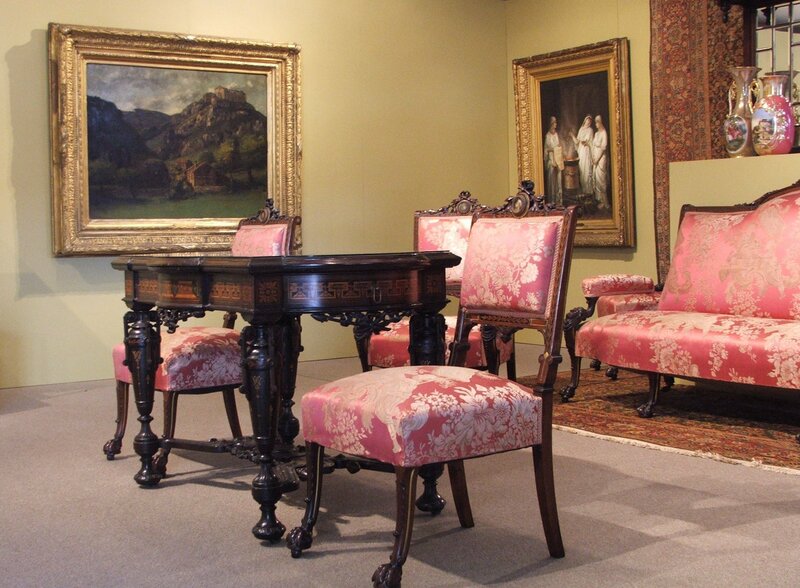 Photo: Part of the Herter suite parlor suite belonging to Jay Gould and Courbet’s landscape.